Hand carry industrial containers are most commonly found in plastic. 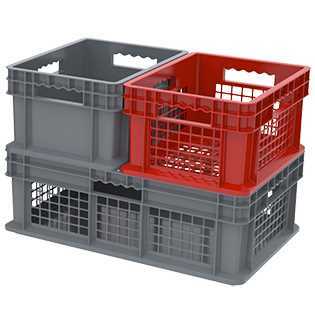 They can be found in the form of plastic stacking bins, shipping containers, distribution containers, security containers, storage containers, boxes, and totes, as well as small hoppers. Hand carry industrial containers can be custom designed and are commonly found in a wide variety of colors. They are exceptional for getting any industrial area organized and are associated with a number of accessories like hanging rails, rotabins, racks, and shelving. CSI provides a wide variety of hand carry industrial containers. We also offer commonly used forklift carry industrial containers and other shop equipment.